AA: These are diffusely infiltrating, malignant astrocytomas that are classified as WHO grade III (8, 9). GBM: These tumors are also diffusely infiltrating but have areas of necrosis and vascular proliferation. They are classified as WHO grade IV (10). Unlike in adults, there is no evidence for previous low-grade astrocytoma in children evolving into these tumors (11). p53: High frequency of p53 mutations(12). 10q: 35–65% show loss of heterozygosity of 10q (13). EGFR: The amplification of EGFR is rare (8). p53: High rate of p53 protein expression (11). p16 and p27: Loss of p16 and p27 (11). Unique type to children: Cytogenetically different from adult GBM (2, 11). Hypercellular: Diffuse, infiltrating astrocytoma with increased cellularity with no microvascular proliferation or necrosis(8). The proliferative index is typically on the order of 5–10%. Atypical nuclei: Cellular/nuclear atypia, increased nucleolar prominence. 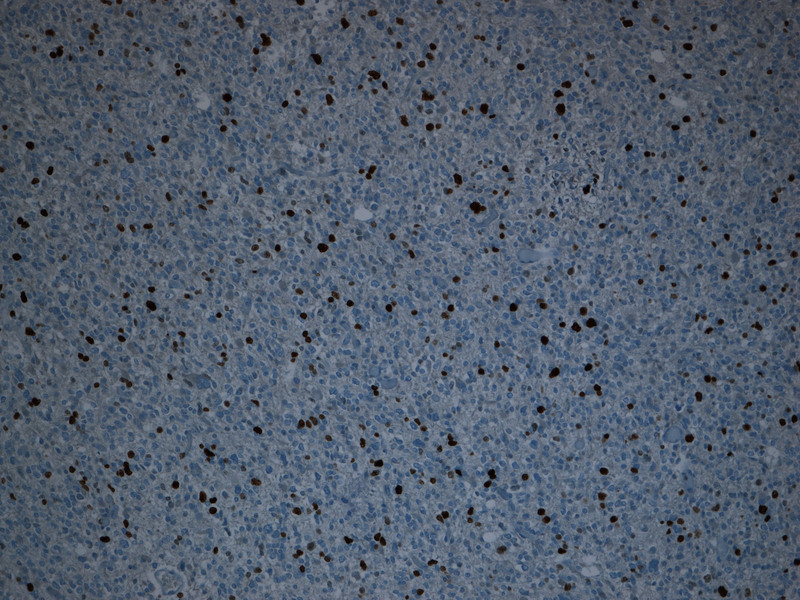 Ki-67 (proliferative index): Many mitoses are seen within this AA. Pleomorphic hypercellularity: Anaplastic cellular glioma that is hypercellular is present with the proliferative index exceeding 38% (11). 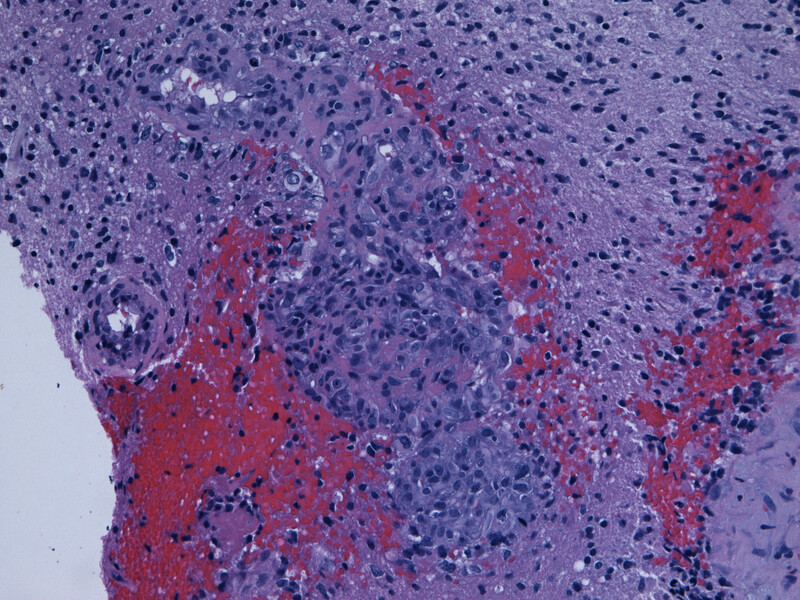 Atypical nuclei: Marked nuclear atypia and cellular pleomorphism. Necrosis and vascular proliferation: Microvascular proliferation +/- necrosis defines GBM (10). H&E stain of GBM: Microvascular proliferation is present. 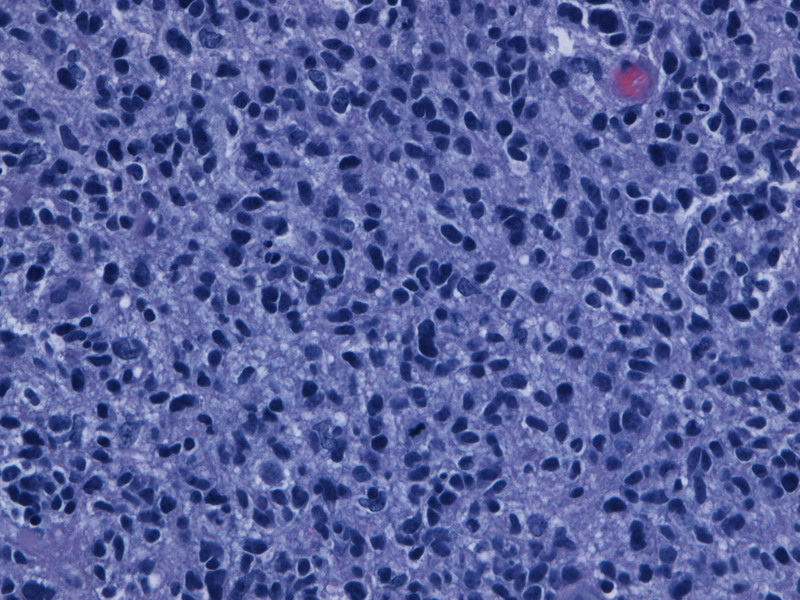 H&E stain of GBM: Mitoses are evident.